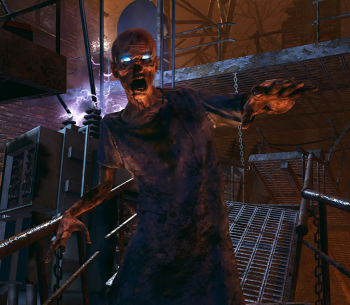 Vita's Call of Duty title favors competitive multiplayer over shambling corpses. If anyone was wondering what it takes to beat a zombie apocalypse these days, the answer, according to Activision man Dan Amrich, is competitive multiplayer. This was the reason Amrich gave when asked whether Call of Duty: Black Ops Declassified for the Vita would feature undead hordes; there would be no zombie mode, because competitive multiplayer took priority. Amrich said this was a "decent reason" for Black Ops Declassified not featuring zombie mode. "[Competitive multiplayer is] the core experience, and that simply needs to come first," Amrich said in a blog post. "There's always a list of things you want to do and things you need to do, and at the end of the day, realistic goals are the ones that people actually attain." There will be a Hostiles Mode for the game, and it will feature player-versus-bot gameplay. No real description of this was to be had from Amrich, except that the bots would not be zombies. It's more of a challenge mode, with the players carving their ways through waves of enemies. Is that enough of a replacement for Call of Duty's beloved zombies? Activision's hoping so.